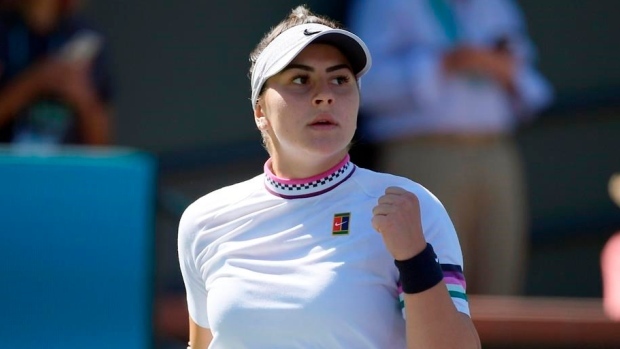 Bianca Andreescu has captured the imagination of Canadian sports fans with her Cinderella-like journey to the BNP Paribas Open women’s singles final Sunday. “She could volley from the chair," Labelle said Saturday as Andreescu geared up for Sunday's final against No. 8 seed Angelique Kerber of Germany. "And we worked on her hand skills a lot so she could improve her drop shot." “When she was younger, she could often catch her service toss," he said. "But sitting on the chair, she adjusted it because she knew if she tossed it badly it was hard to run after it. "She actually improved her serve — even sitting down." Andreescu’s early story was one of injuries so there was understandable apprehension with every new twinge. The stress fractures healed but every time she felt something in her foot, she worried. So even if the back was a little sore during her first-round match at Indian Wells against Romanian Irina-Camelia Begu, she kept going. Even if her left calf, taped in previous matches, was close to cramping in Friday’s semifinal against No. 6 seed Elina Svitolina, she put it aside. “It was a different match than against (No. 20 seed Garbine) Muguruza or (No. 18 seed Qiang) Wang — hitters who take the ball early, keep it deep," coach Sylvain Bruneau said Saturday. "Svitolina puts a lot of balls into play. But it’s not just the winning that’s drawing rave reviews: it’s the way Andreescu is doing it. Andreescu’s game is a breath of fresh air in an era dominated by big forehands and backhands. Being able to rob her opponents of rhythm with her changes of pace isn't unusual. But the Canadian's ability to combine that with power from the baseline to hit winners when the opportunities are created is fairly unique currently in women’s tennis. “We always told her with her tennis she’s going to change the women’s game a little," Labelle said. "We can make a specific gameplan depending on the opponent — and she can execute it. “From there, she could work her natural rally ball, which has more of an arc and beautiful rotation," Labelle said. "And we worked on depth so she could neutralize points with her rally ball. Andreescu’s physical side also has evolved. “She has improved her stamina," Labelle said. "Mentally, you want to finish the points too soon because you know you can't stay long enough in the rally. Of course, Andreescu’s secret is out. And with the leap in her rankings, she'll be playing against the top players every week now. But if there’s a pattern to Andreescu’s game, it’s that there’s … no predictable pattern. “Everything she has, it will stay there, and will continue to improve,” Labelle said. “And in her tactical choices, and choices of patterns, she’ll be clearer about what to do, and when to do it. “My goal with Bianca and the people close to her is to keep her well grounded," Bruneau said. "It’s very different from six months ago when we did things in the shadows, in the smaller tournaments. “You get those small results, those moments, and you keep your eye on the future and say it’s all going to pay off," he said. "But when you get closer to it, see the benefits of all the time and effort you invested, all the sacrifices you made in some ways it’s easier because you don't have to hope for that long-term payoff any more.